If it weren’t for fear of fogging up my mask I’d have been weeping tears of joy. It was a dream I’d had from the moment my baby girl arrived in the world. At birth Molly’s little ears were perfectly curved clams, her long fingers waved like fronds of seaweed, she was a sea creature if ever I saw one. I set my heart on one day introducing her to my passion and returning her to her natural habitat. Now ten years later, there she was, swimming beside me 12 metres below the surface of the Indian Ocean, freshly qualified as a Junior Openwater scuba diver. Jacques Cousteau, the legendary diver had said of our location “In the deep space of the ocean I have found my Moon” and in this remote and elementally unique corner of Africa, my daughter and I felt like mermaids in a vast aquarium, kicking our fins as we swam hand in hand exploring our new world. Fat trunk fish hid in the hollows, a giant moray eel with a face as big as Molly’s gaped out of a crevasse, parrotfish made puffs of coral dust as they munched through the pristine reef, anemones and their guardian clown fish blew to and fro in the eddies. Watching my confident little daughter, exploring this watery world without a shadow of fear filled me with pride and delight. We’d travelled to the ends of the earth to make our ocean debut together. Or so it felt during the 24 hour trip to Vamizi Island, a secret hideaway located in the far north of Mozambique near the Tanzanian border. On an overpopulated planet finding unspoilt idylls isn’t easy, tends toward the terrifyingly expensive and rarely boasts a direct flight. Vamizi ticks the latter boxes and its inclusion on the oligarchs map, in competition with favoured hotspots like North Island in the Seychelles, Soneva Fushi in the Maldives and the wonderful Song Saa in Cambodia would be assured were it not even further off the beaten track. It’s a drawback that conversely makes it all the more attractive and richly rewards those prepared to make the journey. Set in the Quirimbas Archipelago, nicknamed the new Maldives, it’s one of the most pristine marine habitats left on this over-trammeled planet and definitely in the must see before you die category! Private jet owners can halve the journey time but for the rest of us the trip to this Paradise requires some commitment. Our 24 hour journey from London had been broken overnight by my nomination for the best stopover hotel in the world; an abandoned hospital and now seafront hotel called Oyster Bay in Tanzania’s capital, Dar Es’ Salam. A day in the air and then a dusty journey through the traffic clogged city was relegated to distant memory the moment we stepped over the threshold of this macro oasis, birds chirped in the trees, the lush green lawn swept toward the swimming pool and the bedrooms were vast, romantically mosquito netted, and crammed with inspired pieces of African craft and design. Cossetted by first class service, fed on a buffet banquet of local curries, we slept like babies and returned to our journeying refreshed and excited. Thanks to our Oyster Bay sojourn the last leg of our journey was marked by anticipation not marred by exhaustion. 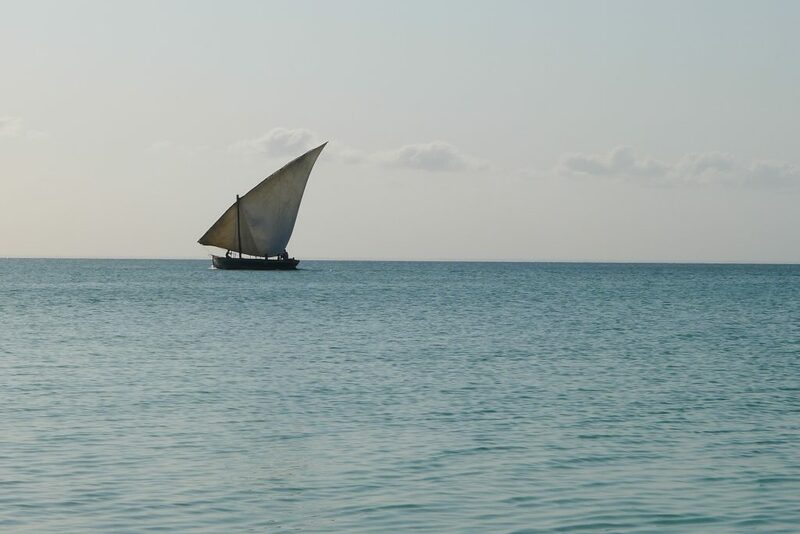 A two-hour flight from Tanzania’s capital, over a stunning spread of uninhabited islands and atolls, compounds the sense that you are at the edge of the world. We were palpitating with excitement at the natural wonder of the archipelago Vamizi forms part of long before we landed on its dirt track runway. Even from the air this scattering of coral ringed islands, dotted around a kaleidoscopic spread of twinkling Indian Ocean in every shade of turquoise, seemed more fantasy than real life. Ringed by reef, each atoll is a study of swirling blues circling inward toward the white sand shores. 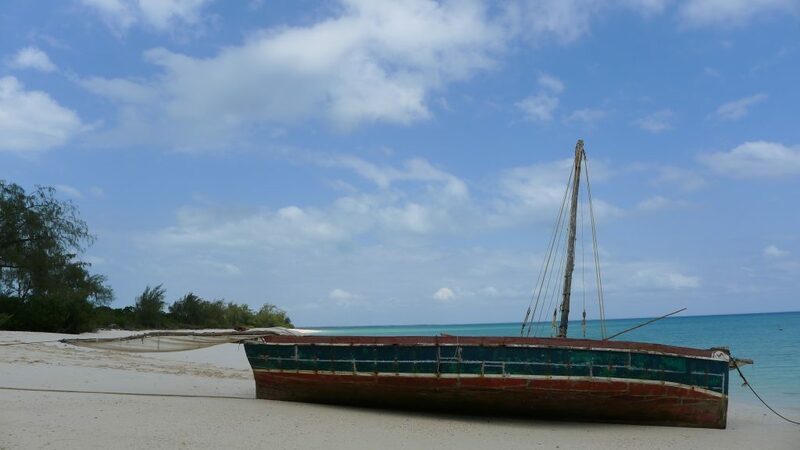 Abandoned during the long years of Mozambique’s civil war, aside from tiny indigenous fishing communities who now provide the islands fresh fish, the archipelago has remained an unspoilt nirvana teeming with wildlife, on land and underwater. Development here is in its infancy and for the visitor it’s like landing in the Maldives a century before the arrival of the Four Seasons and it’s many competitors. Vamizi Island isn’t just a resort hotel; their dream is to create a Mustique style community of the rich and chic. Its an ambition that may have looked like madness in its embryonic stages, coinciding as it did with the 2008 financial crash but looking around today at the beautiful rustic lodge, it’s 17 Kitala’s (spacious, thatched, open fronted beach villas), and six unique privately owned villas it’s a seductive sort of insanity. As the first gathering place for celebrity castaways, favoured by royalty and rock stars alike Mustique has been an unqualified success for fifty years, in providing a destination where the rich can rub shoulders with the rich, a bit like Davos with rum punch. Despite the enduring success of this cornucopia of architectural curiosities, with its fleet of golf carts and Gracia gracing visitors there is yet to exist a copycat project. 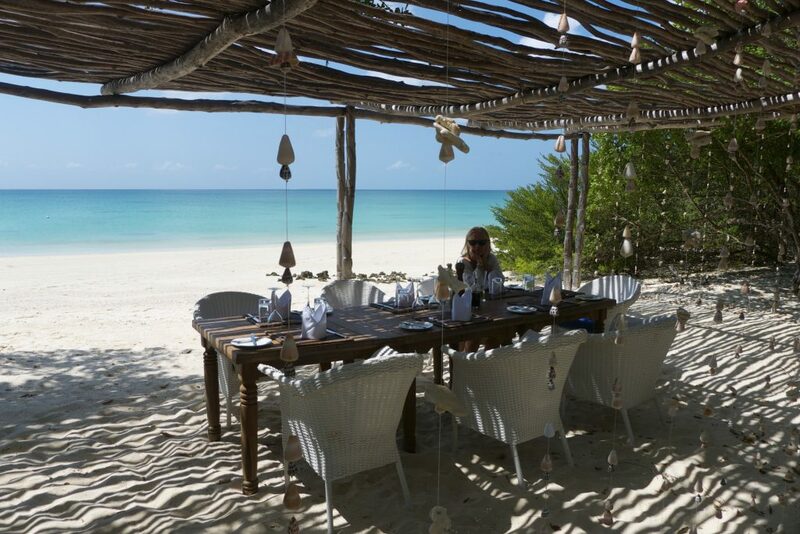 Rustling in the soft breezes that caress the shoreline of sunny Mozambique, Vamizi Island now plans to recreate Colin Tennants vision of a barefoot luxury community of the privileged. 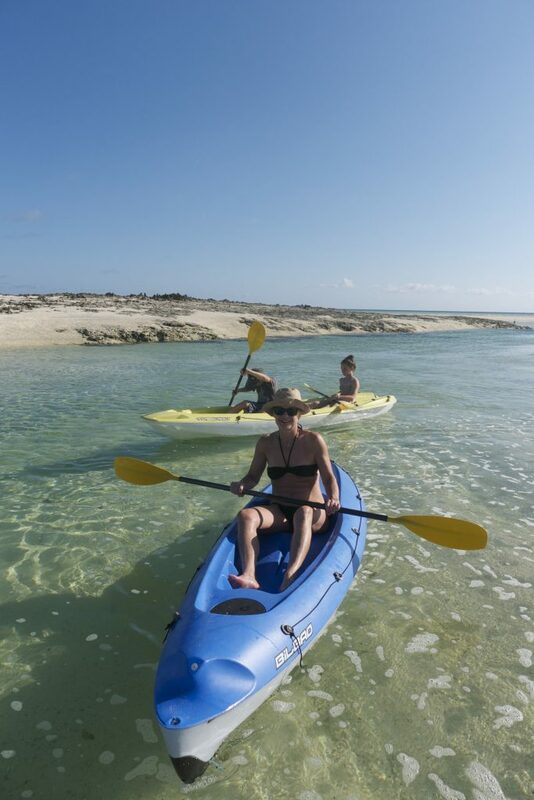 They certainly have the setting right, a breathtaking 14km stretch of white powder sand and sparkling sea, enclosed by a reef that keeps the waves that roll onto the shore at ankle height most of the year. It’s not just Vamizi’s qualifications as a tropical oasis that set it apart but an elemental wildness that similar spots fail to deliver. The carcasses of giant rocks weathered and shaped by the sea are strewn along the beaches, there’s mangrove swamps where you can kayak accompanied only by birdsong, whales swim by, blasting water into the empty silvery blue sky and monkeys shuffle across the beach at breakfast time, checking on their domain. With it’s isolated location and the fall out from political upheaval further up the coast in Tanzania and Kenya mistakenly making unintrepid visitors positively paranoid, it’s hard not to feel respect for the developers Fitzcarraldo style crazy vision. However, with the lodge hotel, and six unique privately owned luxury villas already built and available for rental, it’s increasingly a reality. I’ve never believed that money could buy you happiness but as the decades flash past and the world becomes increasingly overcrowded I’m slightly jealous of those who can afford to carve out a little piece of the planet that’s all their own. The private villas have a butler, a cleaner, a cook and a driver, so staying here is really is like a practice run for marrying Roman Abramovich, though I’m not sure the seagulls and crabs would be as appreciative an audience for conspicuous wealth as the patrons of 55 in St Tropez or Basil’s Bar in Mustique. The architecture, devised by South African firm COA is certainly a cut above its Caribbean competition and exemplary in it’s sensitivity to the landscape. The villas are invisible from the sea and even hard to spot when you’re shuffling down the beach after a Vamizi Martini at the lodge, trying to find your villa! Low lying, barely visible above the tree line each house is made up of a series of rooms connected by external walkways. They differ slightly in exterior and more so internally, with their owners wandering the design spectrum from Balinese style splendor to ethnic African and even a flavor of the Islamic world. This is East Africa after all. In our villa there are giant souzani covered sofas in shades of pink, cerise and turquoise; dining chairs swathed in shocking pink and lobster baskets in clusters as chandeliers. A huge reed rug covers the floor while hunks of driftwood have been carved into coffee tables and tantalising my son, a giant trophy sailfish adorns the bar., a mixture of African art and chairs hewn of giant tree trunks, huge sofas covered in Souzani fabric and shocking pink dining chairs made for an exuberant medley. The light in my bedroom is diffused by the hexangonal patterns carved into the wooden shutters, lending a Moorish quality to the woven window panels. White muslim lifts gently in the morning breeze as does the vast mosquito net that creates a room within a room around our bed. It’s a sensory pleasure to wake early in this oasis of soft light and sea breezes in anticipation of another sun-kissed day of indolence. The real world feels far distant and despite the hotels wi-fi and cellular connection, a baffling achievement in this faraway place, I find myself drifting further and further away from my smartphone, until one evening I realize I haven’t looked at it at all. Then again we’ve all been pretty busy. A friend and Mustique regular mentioned before we set off that he’d heard that it was ‘boring’. It’s true they don’t go in for ‘managers’ cocktail hour or the exhausting chain of drinks parties that the Caribbean hot spot is famous for. 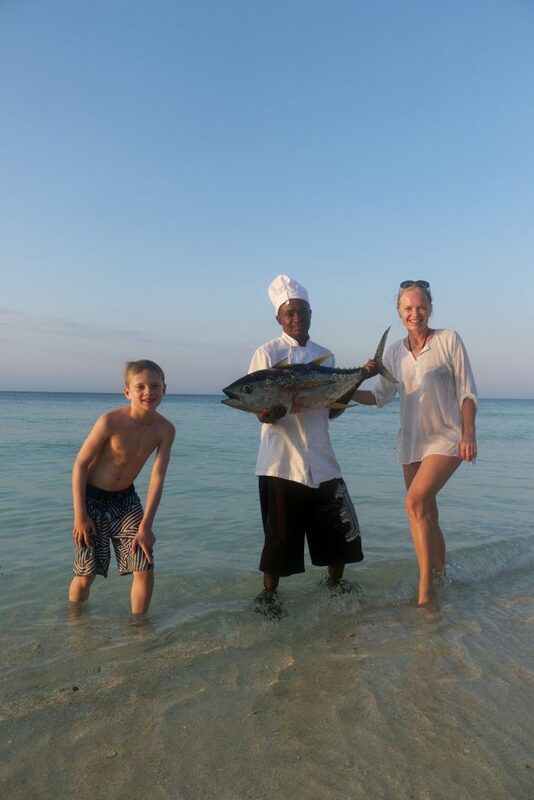 Instead guests are left entirely to their own devices, to explore or laze, take yoga classes or enjoy a massage, go deep sea fishing, take a fly rod on the beach or enjoy a world class diving in biblically stocked seas. We barely had a minute when a member of our group wasn’t busy with one activity or the other. The children spent mornings in the dive shop learning theory followed by an openwater dive. We took advantage of their absence with long walks along the shoreline, admiring exotic bird life, collecting shells and marveling that there was still somewhere in the world where you could be entirely alone for hours on end. 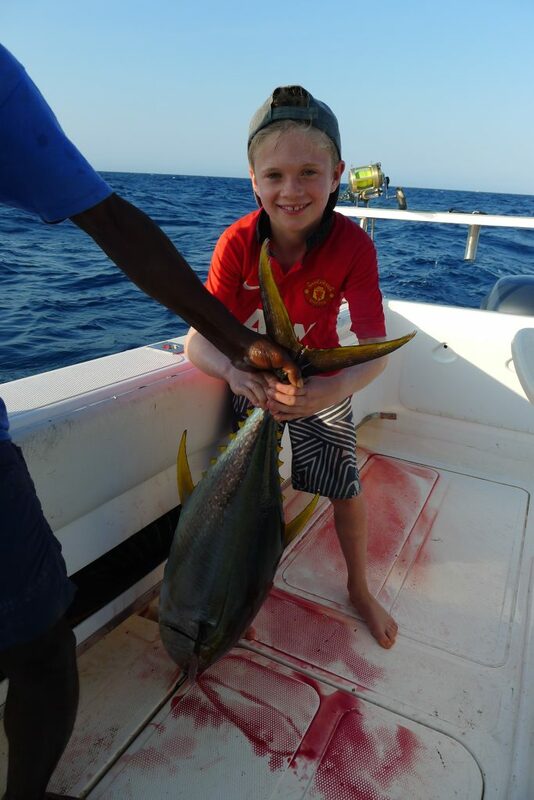 In the afternoons we’d go Deep Sea fishing , 9 year old Dan proving an able and enthuasistic fisherman, pulling in a bountiful catch of delicious tuna and local species that we’d later drag up the beach from the boat and watch our chef chop into sushi, cerviche or plain old steaks for the barbeque. 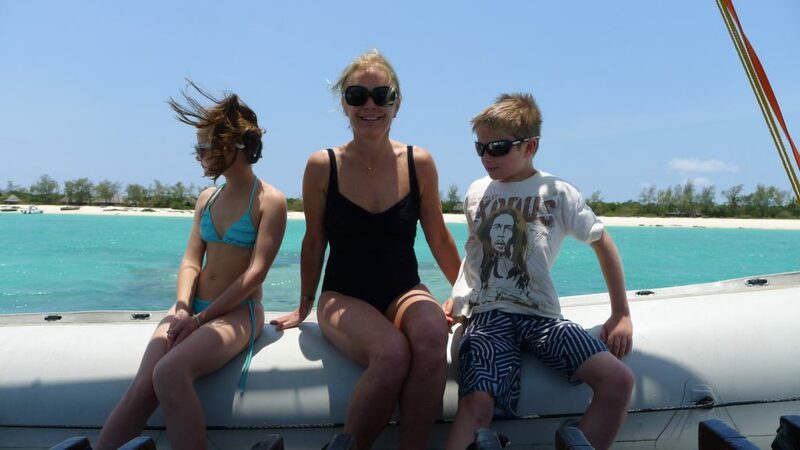 This wasn’t our first trip to Mozambique. Before we had children my husband and I spent an idyllic two weeks in the Bazuruto Archipelago and also some time in the capital Maputo. The natural splendor of this welcoming country with it’s 1000 mile golden coastline is hard to oversell. The civil war and subsequent lack of essential infrastructure has left large tracts of the country unexplored and unpopulated-a reality that can’t last forever. Bad news for we tourists but hopefully good news for the poverty afflicted population. On the horizion at night on Vamizi, the bright lights of a mobile, exploratory gas station would occasionally float into vision, a reminder that the real world, with it’s potential benefits and numerous drawbacks was drifting ever closer. The discovery of giant underwater gas reserves in the Quirimbas area is already posing a threat to world class reefs and natural wonders like Neptunes Arm, a dive site accessed almost exclusively by Vamizi guests that attracts scuba divers and shark fanatics from across the globe. 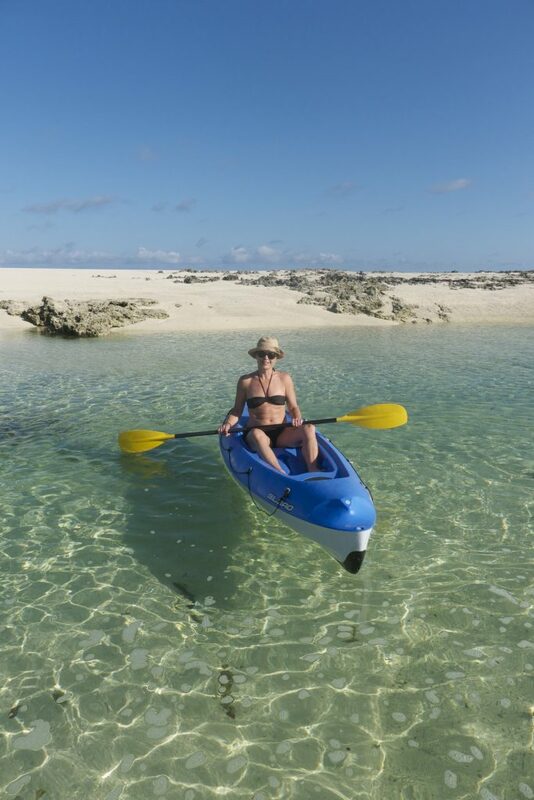 Mozambique is a poor country that needs to exploit it’s resources but the countries extraordinary beauty, elongated and untrammelled 2.5k kilometre long coastline with pristine reefs and marine life are equally valuable assets. Let’s hope that the vast fortunes promised by energy companies will make their way into the hands of the beleaguered and in many places destitute population, instead of a few greedy public officials. The sacrificing of one of the world’s last wildernesses is a heavy price to pay. Our week of decadent luxury and blissful isolation passes at a langorous pace but is over all too fast. The children return from their final dive with excited tales of Kingfish, a giant Napoleon Wrasse apparently the size of a small car and an eel spotted like a tiger. They insist they also spotted a grey tip shark , far away in the gloaming and Jason and I exchange smug glances at having transformed their previous terror of what lurked in the deep into an obsession with sighting one of the worlds most endangered pelagics! Their newfound knowledge and unbridled enthuasism for marine life is worth the journey alone. As they chatter on across the lunch table, fresh kalamari , salad and delicious cornbread , I point out our resident weaverbird, (the hotel restaurant houses an entire colony of them along it’s roofline), sprucing up his dangling conical nest with some bright blue string he’s found, no doubt hoping come mating season it will be a big hit with the ladies. I spend our last night as I did my first, horizontal on a roof terrace built high above the house , taking an evening yoga class under the stars. Bathed in milky moonlight, the wind gently rustling my hair I stare up at the vast expanse of galaxies and stars, feeling infinitesimally small in the face of this enormity. It’s a feeling that marks out our seven days here, that sense of being closer but also inconsequential to the turning of the earth on it’s axis, the oceans ceaseless push and pull and the ever changing elements. At night before bed we gaze down the beach, following the silvery path of moonlight that leads from the shore far out to sea. On Vamizi such moments offer convincing evidence that paradise is here on earth. Away from the headlines, the burble and bluster, the cut and thrust of daily life, in a remote archipelago far from civilization this small planet spinning in a vast universe can still surprise you with a beauty that hurts.